The Coconut Diet is based on the concept that traditional populations that consume a diet high in pure coconut oil rarely display problems with weight gain and are also free of many of the chronic diseases that are common in western cultures. The creators of the diet claim that the fats from coconut are metabolized differently than other fats in that instead of being stored they are broken down for immediate energy. They also state that these fats can increase metabolism and have many other health benefits such as improving thyroid function, digestive problems and antiviral effects. In addition to the emphasis on coconut oil dieters are also provided with information to help to identify specific health issues that may be related to their diet such as thyroid dysfunction, digestive disorders, liver toxicity and blood sugar imbalances. The authors claim that these imbalances can be a hidden factor involved in the inability of many dieters to lose weight. Involves three meals and one or two snacks daily that are focused on lean protein and vegetables. Grains, sweets and most fruits are strictly avoided. It is claimed that dieters can expect a weight loss of at least 10 pounds during these initial 21 days of the program. This phase is centered on the use of various cleansing drinks based on vegetables and fiber that are designed to cleanse the internal organs. A Colonic is also recommended during this phase. Dieters are allowed to reintroduce whole grains, certain fruits and limited amounts of starchy vegetables. This phase is designed to maintain weight loss once the goal weight has been achieved. It slightly increases the list of allowed foods however certain foods such as sweets, alcohol and some fruits are still to be strictly avoided. In each phase of the diet it is advised to consume two to three tablespoons of pure coconut oil daily. Suggestions are given for ways to incorporate the oil into smoothies, salad dressings and sauces. Coconut milk can also be used in recipes, but choose healthy coconut milk brands as some have unhealthy additives. Incorporate coconut oil into these healthy recipes. Dieters are encouraged to engage in both aerobic and resistance training and are advised that as little as 15 minutes of exercise daily will increase health and vitality. These exercises can be used with the Coconut Diet. The Coconut Diet book retails at $13.95. Dieters will also have to purchase virgin coconut oil for use with this diet. Emphasizes low glycemic index carbohydrates. Encourages consumption of fruit and vegetables. Appeals to those who have tried many other approaches without success. May benefit those with resistant viral infections, thyroid dysfunction and chronic fatigue syndrome. Highly restrictive with complex rules. Difficult to eat out and no guidance is given for selecting meals in restaurants. Recipes are complicated and time consuming to prepare. Phase two plans are too low in calories and will produce hunger and possibly an inability to carry out normal daily activity. Recommended foods may be expensive and difficult to find in stores. 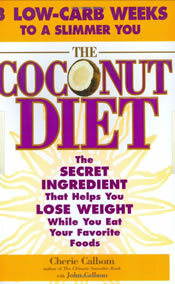 The coconut diet will only be suitable for highly motivated dieters who suffer from chronic illness or fatigue and relate to the philosophy of the authors regarding health and weight management. The extremely restrictive nature of the diet necessitates that the majority of meals be prepared at home and the possibilities for eating out are very limited. Dieters must be prepared to give up alcohol, caffeine, sugar, grains, dairy products and most fruits. In addition dieters must be prepared to spend a great deal of time involved in food preparation and undergo potentially uncomfortable cleansing regimes in order to meet the requirements of the diet. It is highly questionable whether such an extreme approach is warranted, even in individuals with chronic health conditions, and it is likely that results could be achieved with a variety of other far less extreme dietary approaches. Calbom, C., & Calbom, J. (2005). The coconut diet. What are the consequences of the diet over time? My diet is this minus the meat…I eat fish. Basically I consume an entire coconut a day. I drink the water in the morning then chop the meat of the coconut and snack on that through the day and at night I have whatever is left of the coconut plus a grain with veggies or fish and veggies. Ive been living this way for some time. I rarely get sick. Ive maintained the same weight, though see I have gained muscle, that however is due my daily exercise (basically ride my bike or walk everywhere). And in all honesty…it can be very cheap. One coconut is .99 in my city, so weekly we are talking $7.00 for the basis of your diet. Grains vary be usually about two to four dollars a week. Veggies maybe five dollars. And as for as liquid… Water and lemon or lime! hmmm.. this sounds like a really difficult diet. why would you need to have a colonic?